New hidden design desktop socket with multimedia interface, audio, video, power, networking and other interfaces. Just need one box, meet all the daily needs of the socket! Application Place: office / conference office / hotel office / music room / meeting room / reception hall / cybercafe / cafe / bistro / bar etc. 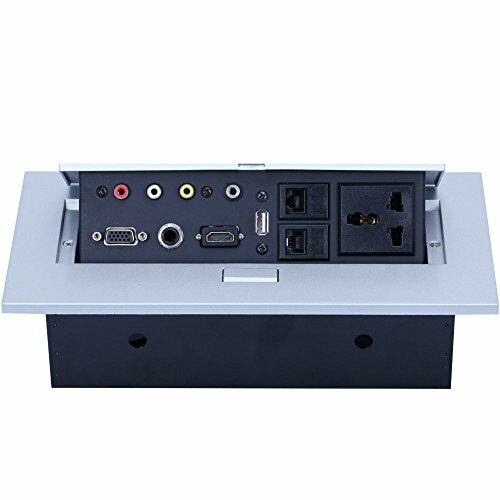 【Multimedia Desktop Power】Multimedia outlet includ 2 network interface, 3.5 audio interface, AV video interface, HDMI interface, USB 2.0, VGA interface, universal power socket, 6.35 mic interface. Just one our desktop power box meets all your needs! 【Wide Usage】This pop up desktop power box can used in office，conference room， A useful equipment for high level video conference, can apply multiplied media functions at the same time, make the connections with your projector / computer / speaker / iphone / ipad / android smart phone, to facilitate our work and to store the cables well. 【Hidden Design】Desktop power with hidden design, all modules are hidden in the plug box, effectively avoid the danger of dust and other object contact outlets, also save more space on your table and keep the table neat. 【High quality material】Desktop power box made of high quality alloy material, thickness panel of 3 ~ 7mm, not easy to bend. The outer panel has antioxidant treatment, not easy to rust. 【Quality Guarantee】 2 years quality guarantee, and 100% SATISFACTION MONEY-BACK GUARANTEE, try it risk free. No questions asked full refunds. If you have any questions about this product by Ebest, contact us by completing and submitting the form below. If you are looking for a specif part number, please include it with your message.